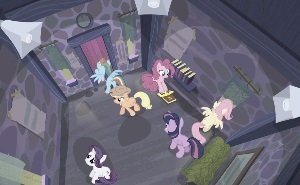 Episode 93: "The Cutie Map – Part 2"
Act 1: Now markless, the Mane Six are confined to a cottage and subjected to recordings of the town's doctrine. The next day, Fluttershy offers to join the town but is asked to name the dissatisfied ponies to prove her loyalty. Act 2: One pony confesses to dissatisfaction and is housed with the others while Fluttershy stays with Starlight Glimmer. She discovers Starlight still has her cutie mark and exposes it in the town's presence. The town revolts and charges the cutie mark vault. Act 3: Starlight flees with the Mane Six's cutie marks, pursued by the Six and four others. 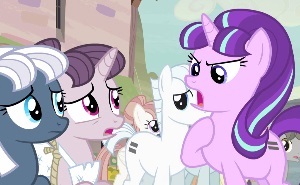 The vault's cutie marks are released, as are the Mane Six's once Starlight is cornered. Starlight escapes, but the townsponies celebrate their return to normal. The rest of the Mane Six spend their lines demonstrating the equal sign's effects and their resulting frustration. All their responses to their predicament are in-character, with Pinkie's descent into Maud mode being particularly unsettling. Starlight Glimmer may not be the powerful giant monster Rainbow Dash was hoping for, but I consider her one of the series' scariest villains because there are so many like her in real life. Like any cult leader, she has ulterior motives, not all of which are made plain in the story, but key to it all is the fact that she doesn't give up what she insists the others do. Others have noted how her approach is opposite that of the Sirens: they created and fed on disharmony, whereas she enforces uniformity. However, both Adagio and Starlight use mind control to gain total power over their followers by twisting friendships into something less than harmony. The four featured new ponies really shine here, and for a very important reason: These ponies need to learn that real success and friendship require the use of special talents, so it's essential that the day be saved not by these outsiders, but by their own special talents. And I like the broader but unspoken message this sends, that the Mane Six aren't the only special ponies in Equestria. 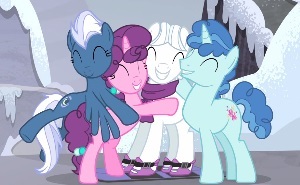 Okay, Twilight's raw power is unprecedented, we get that, but under other circumstances, the kingdom-savers and masters of friendship could have been these four or perhaps others as well. Double Diamond already commanded respect for being Starlight's loyal lieutenant, but his restoration shows him to be a natural and active leader. Night Glider doesn't get as much material but bears some resemblance to Rainbow Dash. Sugar Belle perfectly voices the town's disillusionment as their sincere devotion to Starlight's philosophy is betrayed. The fact that these ponies react with sadness as much as anger is another one of those realistic touches that shows the writers really did their homework on this one. Lesson: There's a famous passage in the book of First Corinthians about how all the parts of the body work together: If the foot says, 'Because I am not a hand, I am not of the body,' it isn't for that reason not of the body, is it? And if the ear says, 'Because I am not an eye, I am not of the body,' it isn't for that reason not of the body, is it? If the whole body were an eye, where would hearing take place? If the whole [produced] hearing, where would smelling take place? But in fact, God has set the parts, each one of them, in the body just as He wished... The eye cannot say to the hand, 'I have no need of you,' or again, the head to the feet, 'I have no need of you.' Rather, much to the contrary, the parts of the body that are considered to be weaker are necessary." Those words have to do with the church, but they apply just as well in a broader context and agree with one of the running themes of Frienship Is Magic: Each of us is different, is special, in ways that make our relationships stronger and our work more effective when we cherish ours and each other's differences and apply them cooperatively for the greater good. The Pixar movie The Incredibles was controversial for how it handled this lesson, but there I think the source of friction was its message that some people are special while most are not. Here we see the heroism of ponies we might have thought were ordinary and just there to be rescued, and Twilight wisely notes how fitting the reciprocation is. The other major takeaway from this story is the confusion of equality with sameness. People are naturally equal, and also naturally different, therefore equality need only be protected, but sameness must be enforced. You see, what we usually mean when we talk about the importance of equality is that we are of equal value, that we have equal freedoms, equal opportunities, equal protection, an equal say in what happens, etc. And ponies so strikingly different as the Mane Six can share this sort of equality and still be free to be themselves. But if, like Starlight, you try to suppress people's differences, you need to have a lot of power over them to do that, and so you end up with neither equality nor freedom. As the pony said, "Either we're all equal or none of us are." So far so good. However, one thing bothered me as I reflected on the episode. It's very heavy-handed and quite a bit one-sided. Now there's no valid defense for cults and totalitarian-style conformity. But there's a more innocuous form of sameness philosophy that's relevant to kids in the viewing audience. You have the phenomenon of mainstreaming all students into one class rather than having some pulled out for gifted or advanced courses. You have children's sports programs that don't keep score and contests where everyone who participates gets the same reward. Now in the story, Starlight's focus is on keeping down the ponies with high self-esteem, who "flaunt their special talents." Now I had a few teachers like that, but the motivation behind mainstreaming and not keeping score is to protect children with low self-esteem, particularly the ones who don't seem as "able" as the others. I'm not really on board with that philosophy, but it has its supporters and there is an argument to be made for it. And viewers who disagree with how the show presents that approach will feel like their best arguments aren't being presented and that they're being smothered or indoctrinated just like the Mane Six. Okay, that criticism sounds a tad harsh, but I'm speaking here of how the episode might be perceived. I'm sure that's not the writers' target, nor do I think it's intended to function primarily on the political/social angle we adults tend to think of. The focus of the stated lesson is on friendships, and how groups of friends cooperate by embracing each other's differences. That comes across well enough, but the show has stumbled into social controversies thanks to messaging and story setting before, and I hope that's not the fate of such an excellent pair of episodes as this. Resonance: After such a serious and creepy Part 1, we get...a still largely serious and creepy Part 2, but with a lot of fun moments and a tremendously satisfying extended payoff in the third act. Standouts in the fun category here are the books that simply have an equal sign printed on every page, Pinkie Pie's barrel of laughs comment, Applejack taking the time to knock over a small pitcher for no apparent reason, and the new ponies pronking across the balloon bridge. One thing that fails to be funny is the Wilhelm scream, only because it's really getting old at this point. As I'm writing this, it seems the sound team is determined to work it into every episode. I'm hoping that trend doesn't last. I was impressed with Twilight's determination in staying up all night to think while the other ponies sleep. Party Favor's sacrficial confession is an awesome character moment of the sort usually reserved for recurring characters or celebrity guests. Also awesome are Party Favor's balloon implements later; that is a fascinating reality-defying talent there. Sugar Belle comes close to rescuing the Mane Six's cutie marks single-hoofedly. 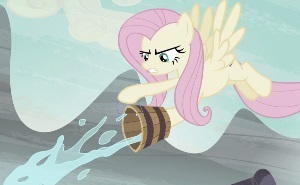 And I've got to mention Fluttershy's bravery again in her chimney escape and later confrontation. As I said, the creepy continues in the cult-like atmosphere and the corruption of our friends, and it intensifies when Starlight's boiling hot anger comes out. A couple of sad moments got to me here as well: just seeing Applejack without her strength, bucking to no effect, and Fluttershy wilting upon seeing Sugar Belle and Night Glider as she's led into Starlight's cottage. Logic: One brief note that I'll file under logic and continuity: The series is fairly consistent in the idea that a cutie mark represents your true self by identifying an already-existing talent. It doesn't change who you are, with the single exception of The Cutie Pox, whose marks were ingenuine. Here we see magic that removes and replaces cutie marks, with the victims thereafter losing their special talent. Is this not inconsistent? I don't think so, because we see the equal sign flashing to force not just loss of talent but a general mediocrity. It's not the loss of their true marks, but that sign that's keeping the ponies powered down. I think this is probably specific to the kind of spell Starlight Glimmer is using, and the sign is an enforcement mechanism. There are other questions about the power and value of the stolen cutie marks, but I'll leave them be since that might be addressed later in the season. Other Impressions and Final Assessment: The confinement of the Mane Six is impressive both in its realism and its attention to detail. The recorded mantra thing does really happen, though more in political contexts than in religious cults, I believe. You'll notice the clock is stopped, probably a deliberate move to add disorientation, though to really make this work you would do it without windows and vary the time of day they were brought out. Camera work, or the animation equivalent of it, is used to dramatic effect; I like that Fluttershy's pivot to volunteering plays out in a single shot. In the end, while I have mild reservations about the one-sided anvil dropping, though it's admittedly one of my favorite anvils, I have nothing else but praise for The Cutie Map: for the believable presentation of the setting, the courage in both the setting and intensity of the story, and the character work put into the new faces. A solid Diamond for the first story of the fifth season.